PITTSBURGH, Jan. 29, 2019 /PRNewswire/ -- ANSYS (NASDAQ: ANSS) is making simulation even more pervasive through the ease of use and new functionalities of its newly released ANSYS® 2019 R1. 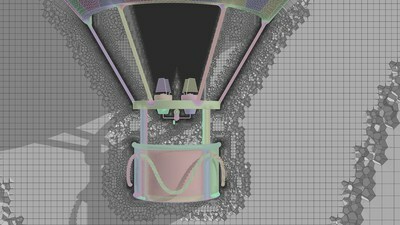 From a revolutionary user experience in ANSYS® Fluent® to hyper-accurate additive manufacturing solutions to the introduction of groundbreaking capabilities in the new ANSYS® Motion™ product line, ANSYS 2019 R1 enables engineers at every level to develop the most innovative products across a multitude of industries. Megatrends like 5G, autonomous vehicles and electrification are radically changing the product development landscape, making it difficult for companies to retain engineers who can keep pace. The new capabilities across ANSYS' entire simulation portfolio empower engineers, regardless of level of expertise, to simulate from beginning to end faster and more intuitively, maximizing their productivity. "ANSYS' multiphysics solutions enable engineers to keep pace with increasing demands despite decreasing budgets, training and timelines," said Shane Emswiler, vice president and general manager for ANSYS electronics, fluids and mechanical business units at ANSYS. "With the unparalleled improvements in ANSYS 2019 R1, ANSYS ushers in the next generation of Pervasive Engineering Simulation and enables engineers at every level to adopt simulation more seamlessly across the entire product lifecycle." "Mosaic technology enabled Fluent Meshing Workflow allows us to reduce the preprocessing time of our electric generator thermal simulations from six to eight days to four hours," said Itsaso Auzmendi-Murua, research and development thermal research engineer, INDAR. "It provides us an automated and robust preprocessing tool that accelerates our thermal designs and translates into more confident predictions about the future performance of our generators." "Mosaic-enabled meshing technology enables us to reduce mesh size by up to 30 percent, mainly in large sizes. Mosaic, along with ANSYS' task-based watertight meshing workflow, speeds the setup and the mesh generation process so we can create high-precision meshes faster, even in complex geometries," said Pablo Fernandez, research and development manager at Schako Iberia. "These are the most remarkable advancements in meshing technique in recent years and we estimate that they will reduce our development time by up to 15 percent." New to the ANSYS portfolio, ANSYS Motion is the most powerful multibody dynamics (MBD) solution on the market. Developed by South Korea's Virtual Motion, Inc., ANSYS is now making this industry-proven technology available to its global users. The third-generation MBD solver offers a full suite of dynamic capabilities for both rigid and flexible bodies. The product line features an extensive range of powerful application-based toolkits — enabling users to model complex mechanisms, including drive systems and vehicle handling, with ease. New offerings in the electronics and electromagnetics suite include EMI Scanner, electromigration analysis and noise-vibration-harshness (NVH) capabilities. EMI Scanner is a new feature within ANSYS® SIwave™ and ANSYS® HFSS™ that can quickly identify areas of potential electromagnetic interference on users' printed circuit board designs prior to simulation — eliminating errors and speeding time to market. In ANSYS SIwave, electromigration analysis enables users to predict mean time to failure for on-chip and advanced electronic packaging structures. NVH is a new workflow that includes ANSYS® Maxwell®, ANSYS® Mechanical™ and the acoustic solver coupled together through ANSYS® Workbench™. The workflow calculates the electromagnetic noise of a machine when it vibrates due to electromagnetic forces — producing a complete noise profile of an electrical machine within hours. With breakthrough updates to the ANSYS® Additive Suite™, including a new product, ANSYS provides the most powerful simulation solution on the market for metal additive manufacturing (AM). The newly released ANSYS Additive® Science™ delivers an exploratory environment for engineers to determine the optimum process parameters for metal AM machines and materials — helping users understand how changes to machine parameters affect meltpool sizes and material porosity. Within the existing tools, ANSYS® Additive Print™ widens the range for supported materials and is faster with improved robustness for thin-walled structures. ANSYS® Workbench Additive™ increases accuracy while maintaining reasonable model sizes through a new meshing option - layered tetrahedral elements - that significantly impact model fidelity in geometries with fine details. "We help customers optimize geometries for additive manufacturing across industries, from aircraft to energy to oil and gas. Using ANSYS Additive Print to simulate how materials will behave during the printing process, we shorten the development process and reduce the cost of trial and error," said Sven Donisi, managing director, Rosswag Engineering. "ANSYS enables our customers with more freedom to design and create new alloys with less risk." Improvements to SCADE® Suite for automotive applications make it simpler and faster to comply with industry standards like AUTOSAR and ISO 26262 when developing model-based systems and software for autonomous vehicles. "The latest version of ANSYS SCADE Test provides us with a number of improvements enabling huge savings in both effort and time during the testing phase of our product development process," said Christine La Porte, flight control application software engineer, Dassault Aviation. "We will use this new version of SCADE Test for both our current and upcoming projects to enhance our time to market." In the systems suite, ANSYS® VRXPERIENCE® integrates two new camera models enabling users to test the perception algorithm in night driving conditions. The new models also validate automotive systems in dangerous conditions that are complicated to reproduce in physical tests. VRXPERIENCE also includes advanced simulation of scenarios with traffic and vehicle dynamic for head lamps, sensors and HMI use cases, and the product now contains a SCADE plug-in interface allowing users to get faster rapid prototypes for lighting or ADAS control laws. With new features in ANSYS® medini analyze, users can more quickly and accurately perform functional safety analysis for DO-178C and other standards on aircraft systems. The new ISO PAS 21448 on Safety of the Intended Functionality (SOTIF), in combination with ISO 26262, addresses unreasonable risks in the absence of the malfunctions of the electric and electronic (E/E) systems in automobiles and other land vehicles. SOTIF issues are especially important for advanced driver-assistance systems and autonomous vehicle (AV) systems. New capabilities in ANSYS medini analyze enable automotive and AV users to perform SOTIF-related analysis of E/E systems. In the optical suite, ANSYS® SPEOS® strengthens predictive design capabilities for creating, testing and validating a virtual design in a fast iteration loop. ANSYS SPEOS also ensures compliance with international standards and regulations including SAE International, the International Electrotechnical Commission and Insurance Institute for Highway Safety. The ANSYS SPEOS Head-Up Design and Analysis add-on enables users to anticipate and simulate perception issues like blurry images at a very early development stage — drastically reducing the need for time-consuming and expensive physical prototypes. "Oceaneering provides remotely operated vehicles to more than half of the world's offshore oil rigs," said Todd Newell, vice president of technology, Oceaneering. "We are developing our next-generation, autonomous vehicle using a combination of ANSYS flagship products, optical and embedded software solutions to test designs and validate algorithms for obstacle avoidance." In the 3D design suite, ANSYS adds topology optimization to ANSYS® Discovery™ Live – taking a leap forward in making digital exploration and generative design accessible to every engineer. Through real-time shape optimization, engineers can take their ideas to a new level by drastically reducing weight, while retaining strength and creating shapes not previously possible. These capabilities are delivered with the award-winning speed and ease of use associated with Discovery Live. ANSYS® Discovery™ AIM® expands its physics capabilities by adding a random vibration solution, a common and useful feature for engineers in the aerospace and defense industries. Engineers can now observe the likelihood of a certain displacement or stress due to excitation within a range. ANSYS® Discovery™ SpaceClaim® now includes two beta features targeted at creating and parameterizing any concept model by including sketch constraints and feature tracking.